The CrossFit Open is an annual competition that marks the start of the CrossFit Games season. As a box, we compete in the Open each year. This year, we will do things a little different. We’ll have our own competition called The Intramural Open. 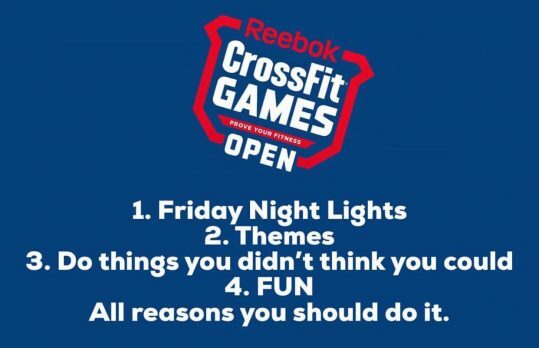 The CrossFit Open is a Worldwide competition, while the Intramural Open is a GYMWIDE competition. The Intramural Open is a chance to team up with friends at the box and compete for bragging rights in a fun, friendly supportive competition full of good times and camaraderie! You do NOT need to be signed up for the Open to compete in the Intramural Open. However, it is still encouraged for those who would like to take part (see me if you have questions) and you can register at games.crossfit.com. You will still post your scores for the Open if you chose to sign up BUT your participation with your ACF family will be more important because it will help your team score points toward an in house victory!! Sin up on the whiteboard or contact me directly by this Wednesday 2/20 before 4pm. Those who sign up (and I hope you all will) will be part of a random draft pick by our Team Captains Wednesday evening. The CrossFit Open consists of five workouts (one per week) revealed every Thursday @ 5pm for five weeks. Each workout has an RX and scaled version. These workouts will serve as our Intramural Friday Night Lights competition Workout! Friday Night Lights workouts will start at 5:00pm every Friday beginning this Friday 2/22. +2 Point – Attendance: every member of a team that completes an Open workout during Friday Night Lights earns one point. One point will be awarded to team members who complete the Open workout at a different time. Saturday mornings @ 10:00 will be a makeup option. +1 Point – Top 2: every male AND female member who places among the Top 2 at ACF for each workout (RX and scaled) gets an extra point for their team. +5 Points (team) – Spirit: The team with the most noise, pride and PRESENCE each week will receive 5 bonus points! +2Points – Theme: 2 points for each member who dresses up in the theme for that week. Keep it simple and FUN!! +1 Point: 1 point for every team member who PR’s a workout. +5 BONUS points: final night 6th secret workout to be revealed on the final night!! This FRIDAY 2/22 – 19.1 Beach Party – Margarita Madness kickoff. ACF will be mixing Margs for all to enjoy following the WOD. BYOB otherwise! Friday 3/22 – 19.5 Superhero – POTLUCK & BBQ to follow our final workout of the Open Season. The winning Team will receive cool swag and prizes AND have their winning banner hanging for all to see for 2019!! Bring your family and friends to join in the Fun and cheer you on! !